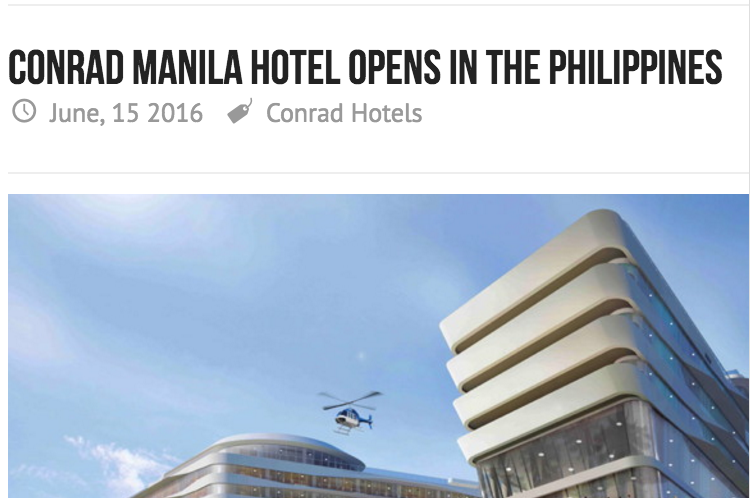 Last 15th of June 2016, Conrad Hotels & Resorts makes its debut in the Philippines with the opening of Conrad Manila. Owned by SM Hotels and Conventions Corporation, a subsidiary of SM Investment Corporation and managed by Hilton Worldwide (NYSE:HLT), the 347 room Conrad Manila is located at the forefront of the Mall of Asia complex, in the heart of the 42 hectare Bay City development, a destination earmarked as a shopping, leisure, and business hub. 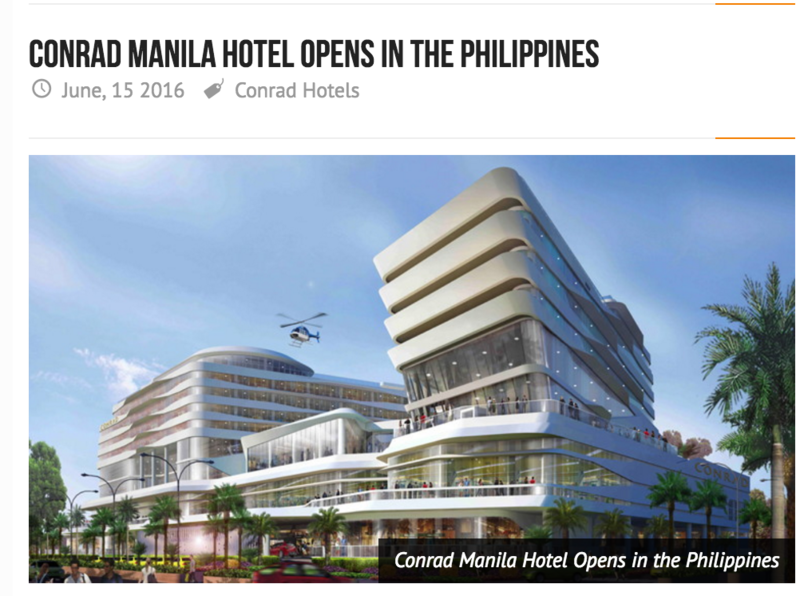 “We are delighted to establish Conrad Hotels & Resorts in this vibrant capital of Manila. The award-winning Conrad Manila, which enhances our portfolio, underscores our commitment to delivering best-in-class hotels in key gateway locations that meet the growing needs of global luxury travelers. An inspiring destination, Conrad Manila will delight guests with intuitive and customized service, as well as provide them access to a world of connections and inspired experiences,” said John T. A. Vanderslice, global head, Conrad Hotels & Resorts. “The stunning Conrad Manila is an exceptional addition to the Conrad Hotels & Resorts portfolio and we are delighted to be partnering with SM hotels on this exciting project, who share our passion for excellence. Its opening underscores the growth of our portfolio across Asia Pacific and our continued commitment to the dynamic market of the Philippines. This landmark property perfectly complements the vibrancy of this amazing capital city and will set the benchmark for luxury accommodation in Manila,” Martin Rinck, president, Hilton Worldwide, Asia Pacific. “We are pleased to work with Hilton Worldwide in bringing the esteemed Conrad brand to Manila. Amidst the robust tourism outlook, the most anticipated opening of Conrad Manila will definitely be a game changer in the already exciting Philippine hotel scene,” says SM Hotels and Conventions Corp. President Elizabeth T. Sy. “We look forward to a fruitful partnership with Hilton Worldwide in further elevating the hotel industry in the country,” adds Ms. Sy. Poised to be the venue of choice for business, social events, and weddings, Conrad Manila offers four contemporary event halls and two sophisticated ballrooms, spanning more than 4,000 square meters, which are fitted with state-of-the-art audio-visual technology. For intimate al fresco parties, guests can also opt for The Veranda, an outdoor garden space overlooking the city scape. At Conrad Manila, all 347 guest rooms and suites are specially designed with an intuitive technology. Upon sensing motion in the room, the air conditioning switches from energy-saving mode to cool, the curtains in the room will automatically open with ambient lighting set to match the time of the day. Guests can instantly feel at home with a 42-inch flat screen HDTV with an IPTV menu, Wi-Fi and wired Internet access, Nespresso machine, Bluetooth-enabled entertainment technology and hydrotherapy rain showers. Suites and executive rooms offer picturesque bay or city views, with access to the Executive Lounge, and bathrooms that feature in-mirrored TV for an uninterrupted entertainment experience. Brasserie on 3 offers an eclectic mix of sustainable and organic dishes ranging from hearty to healthy dishes. The restaurant also features al fresco dining overlooking the bay, private dining rooms for intimate celebrations, and an exclusive chef’s table, where diners can enjoy a special tasting menu with a curated selection of organic wines. China Blue by Jeremy Leung presents a modern interpretation of the traditional Chinese cuisine, artfully curated by Chinese celebrity master chef, Jereme Leung. A first for a Chinese restaurant in the Philippines to partner with a celebrity chef, China Blue by Jereme Leung takes Chinese dining experience to a new high with its authentic cuisine, modern interiors, and floor-to-ceiling glass windows that offer panoramic bay views. C Loungeis inspired by the city’s distinctive culture and lifestyle, where guests can enjoy a wide selection of beers, liquors, and locally-inspired cocktails. With a laidback vibe during the day, it transforms into a sophisticated destination bar at night. Its al fresco area offers guests an awe-inspiring visual of the Manila sunset. Conrad Manila offers the popular Conrad Concierge mobile app, which gives global luxury travelers the ability to customize details of their hotel stay before, during, and after visit via a smartphone or tablet. Whether it’s pre-selecting bath amenities or checking-in while in-transit from the airport, guests can access a variety of features by using the app. Conrad Manila participates in the Hilton HHonors®, the only guest loyalty program where guests who book directly through www.conradhotels.com have access to benefits including an exclusive member rate that can’t be found anywhere else, free standard Wi-Fi and popular digital tools available exclusively through the industry-leading Hilton HHonors mobile app, where HHonors members can check-in and choose their room at over 20 Conrad hotels worldwide.